Hello everyone! 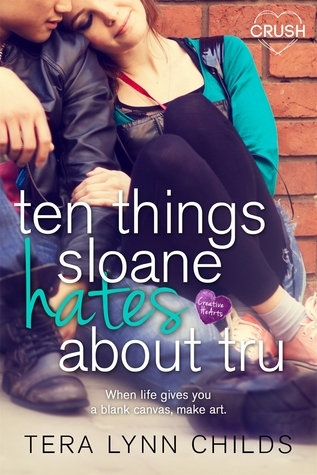 I am back today after a very long absence with a review of Ten Things Sloane Hates About Tru by Tera Lynn Childs. I got an ARC from the publisher in exchange for this honest review. The protag, Sloane is an art student who had to move from New York to the last place she wanted to be: Texas. She had no interest in the people there, the weather, the traffic or the boy next door who seemed like the troublemaker she didn’t need to be hanging out with. You see, Sloane was on probation (set by her mom), behave in a perfect fashion and she gets to move back to New York; screw up? It’s Texas for life. But all that sort of changes when she gets to know the one guy she shouldn’t want to know- Tru. Tru, like many characters in many books has a secret to hide but this time it’s a secret that readers are privy to early in the book. So um- no suspense there. Look at it like this: thanks to the dual POV of the book, we get to know the characters’ secrets before other characters do. To start, I really liked how the author made art a part of the storyline and didn’t just have a bunch of art students who didn’t do anything artistic at all. Instead we get a school – full of art students – with top-notch art facilities that seemed like every art students’ dream school, at least that’s what I thought. Apparently, Sloane wasn’t finding herself all too lucky to be in said art school, NextGen Academy. Which I could understand in the beginning- I mean, being uprooted on senior year can’t be too fun. 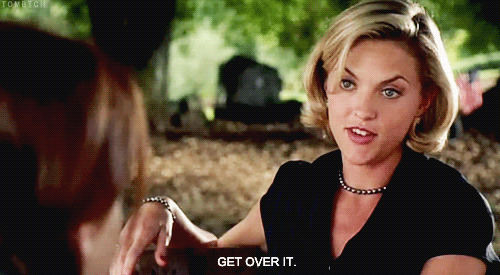 But if I’m being honest, Sloane’s attitude toward it started to annoy me at a certain point. It’s just like she was so busy moping around and hell-bent on not enjoying herself that she didn’t realize SHE WAS MAKING HER OWN LIFE MISERABLE. You screw up and have to face the consequences? Well, face it. You do the crime, you do the time. The thing is I didn’t find her “sentence” all too unbearable; spending time studying in a fantastic art school, making new friends, meeting an interesting guy and overall getting new experience? Whining aside Sloane wasn’t a bad character to get to know; strong-willed, sarcastic and artistic; she had personality. And when I finally found out the big “Incident” that had her stuck in Austin I was like, “So that’s what she did.” I don’t want to spoil it for you so, read it and find out for yourself. Now let’s get to Tru… Tru is one of the most misunderstood characters I’ve read about. Nobody sees the real him; nobody sees that behind his charming smile and words, hides a terrible home life, nobody but Sloane. On the other hand, Sloane’s mom is convinced Tru is a serial screwup -even without having a full conversation with him- and doesn’t want Sloane hanging out with him. Like, can people stop judging people you barely know?! I wanted to give him a huge hug (one of those rib crushing ones) and make everything better. But that wouldn’t be enough; I also wanted to do unspeakable things to the person who hurt him and save him from further pain. Tru truly opened up to Sloane in a way that left him vulnerable and it was all just so raw and heartbreaking to have anyone go through so much, needless to say a teenager. And to be able to put a smile on everyone’s face and not be cynical after all that? Tru Dorsey, I salute you. The romance between Sloane and Tru didn’t feel rushed at all and really felt like only the beginning to me. I want MORE of them as a couple and please more of them working together as a team. While the plot wasn’t extremely complex, this book just had something about it that’ll make you want to go on reading- if only to find out Sloane’s secret and what happens to Tru. Which led to minor disappointment for me because the ending left a lot of loose ends. We don’t really know what happens to Tru and his family problem, it also looks like Sloane’s parents were keeping something from her and a few other unsolved mysteries. But I found out that there’s going to be a sequel, so I really hope that it’s going to be about Sloane and Tru and will answer the questions in my head right now. Overall, Ten Things Sloane Hates About Tru is a light, artsy book that deals with some rebellion and is of the clean romance variety. A relatively short and quick read, it will leave you wanting a sequel, no doubt. Boy, it feels like years since I’ve last read and reviewed a book; I really miss it and of course, you guys too! I hope all is well in the blogosphere and I apologize for my lengthy absence but unfortunately there’s going to be a few more months of AWOL from me. So please bear with me while I finish my exams and get some personal things sorted out. Welcome back, however briefly!! It is good to “see” you again! Likewise, Raven! Thank you and I can’t wait to be back full time, I feel like I’ve been missing so much. Good to see you again! I loved this review very much and I’m definitely convinced to pick this book up! At first glance I probably wouldn’t but after your review, it’s definitely a possibility!